After our families, teachers are the ones who inspire our lives the most. The teaching profession has been considered one of the most under-appreciated professions. And the reason is that the social value and hard work of the teachers go unrecognized by us. No matter whether you are into your college or job at the moment, just appreciate the hard work your teacher did for you. Throughout the study phase, teachers are the one who supports, motivate and influence us in shaping our lives. Teachers are the people who create a great impact in our lives, but we never recognize it. On the one hand, our parents give us the life to live, and on the other, teachers make us learn how to live it. They do a lot for our better future, and they do deserve a simple Thank you at least. But, yes, thanking your teachers is showing them your gratitude and respect. It is not necessary to wait for appreciation or teacher’s day to thank your teachers. You can appreciate their efforts and support for you any day with a thank you gift. So, if you are looking for the messages to say thanks to a teacher, then this is the right spot because here you will find an excellent collection of thank you notes for your teachers. Before moving forward, do you know the actual role of a teacher and who is a teacher? It seems to be a simple question, but answering it 's hard because a teacher is not just your support, but is your second family who loves you, scolds you, cares for you. They don't only give you strength and support throughout, but even teaches us to live our lives with discipline. They play a unique part of being a mentor and a role model in our lives. Teachers do a lot for us, but did we care to appreciate them for everything they did for us? You might not have got a chance, but don’t just wait now and say thanks right away. Teachers are the epitome of strength and support to you, so don’t hesitate. Coming back to our main discussion, how to say thanks to a teacher. 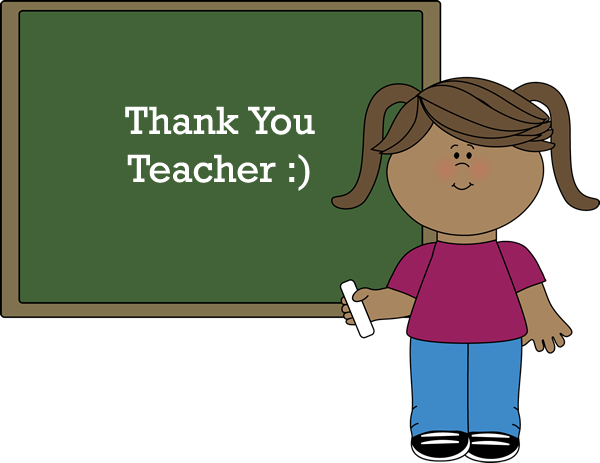 We would just say that you will find the right words of appreciation for your teacher here. A million thanks to you my teacher. I have seen a vast improvement in me when it comes to learning new concepts. Thank you so much for nurturing me. You are the reason behind my great achievements in my life and career. You have imparted me with so many good things which always helped me to live my life in a better way. Thank you so much, teacher. It is easy to take you for granted, but it 's hard to forget your inspirational words. It is easy to misbehave in class, but it 's hard to overlook your motivational advice. It is easy to spot annoyance in your behavior, but it 's hard to realize the patience you have while dealing with us. Thanks for overlooking us always. Instead of leading us by holding our hands, you asked us to walk ahead while you caringly observed from behind. Thank you, teacher. Inspirational teachers like you can make our classrooms lively and fun. You are the valuable part of our lives teacher. Thank You. The scientific breakthroughs and technological inventions don’t hold our future. The enthusiastic and inspirational teachers like you hold our hands and support us for our future. Thank You. We know that teaching can sometimes be thankless. Today we want to thank you for giving us an education so priceless. Thanks. Whatever I am today is all just because of your strength, support, and motivation. I owe my success to you. I got an excellent teacher like you. Thank You. You are the one who taught us the principles of life. You deserve the best of everything in your life teacher. You motivated and inspired us for our better future. Thank You. Teaching is a stressful job. But you have been more than a teacher to us. You are always supportive, understanding and kind to us. Thank you for everything. Some teachers just give their time and energy wholeheartedly to their students. So, don’t you think that they do deserve your appreciation and respect? People believe that teachers dedicate their lives for money, but they do for praise and the future of our country. They want their students to bring a difference in the society and change to this world. They inspire us to be a better person. A simple thank you can do wonders as it can make them feel appreciated and extraordinary. Just take a little time out of your busy schedule and say thanks to your teacher. Choose the right words from above to express your gratitude towards them.